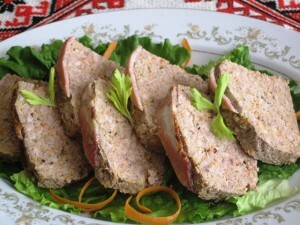 Ground meats, such as beef, turkey, chicken, veal and pork, are a versatile ingredient in creating many different dishes. Most popular ground meat dishes are hamburgers, meatballs, Sloppy Joe, Tacos, Chile, and meatloaf. I personally prefer to prepare my own ground meat meals, since it gives me full control over the quality of meat I will be using in my cooking. I prefer to use very lean ground meat, to avoid the harmful to our health fat and sodium, found in many store-bought meals, or ready-made fast foods meals. 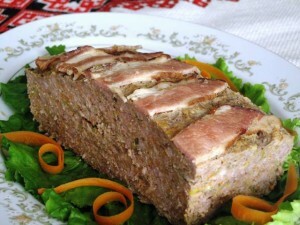 Today I will post my recipe for meatloaf, which can easily feed a family of 6-8. Heat a saucepan with 2 Tbs. of oil, and saute onions for 2 minutes. Add carrots and celery, and saute 2 minutes. Add garlic and saute less than a minute. Add salt, pepper, water, Worcestershire sauce, ketchup, and Italian Seasoning. In a small bowl mix Panko crumbs with milk, and let the crumbs to soak up the milk. In a large bowl, place the ground meat, eggs, parsley, and Panko crumbs mixture. Gently fold in to incorporate. Mix in sauteed veggies with spices. Grease a loaf pan with oil, or shortening. Pack the meatloaf mix into the pan, and smooth it evenly to fit snugly in the pan. Place strips of bacon across the top of the meatloaf. Bake in preheated oven to 350 degrees F, for 45 minutes, or until the inner temperature reaches 160 degrees F.
Remove from oven. Cover with foil paper, and let it rest for 10 minutes before serving. Serve with your favorite gravy, mashed potatoes or brown rice, and steamed veggies. Mushroom Gravy is my favorite.. This meatloaf, as any other ground meat dishes, freeze very well for future use.